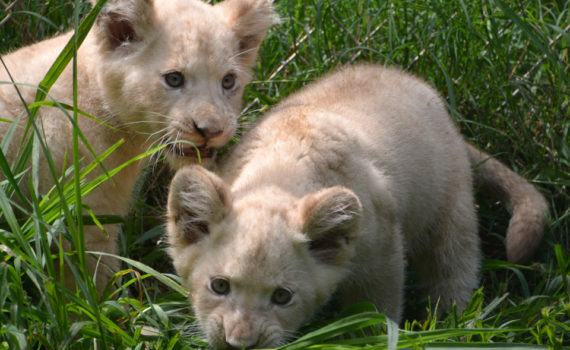 The Metro Richmond Zoo is excited to announce our 3 White lion cubs are now on exhibit! Xonga gave birth to 3 cubs on April 2nd, 2018 after a 110 day gestation period. There are 2 females and 1 male. The cubs initially spent two months inside their private den with Xonga. This allowed time for the cubs to learn to walk, play with one another, gain their strength, and mom and babies to bond. Now that they are old enough, Xonga and her cubs have been introduced to their outside habitat. The cubs have begun to eat meat, but continue to nurse from mom. 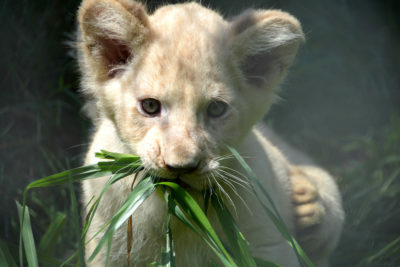 Lion cubs are not fully weaned until the age of 6 months. At 3-4 years, White lions reach maturity. Males begin to develop fuzz around their neck at one year which will grow into their characteristic mane. 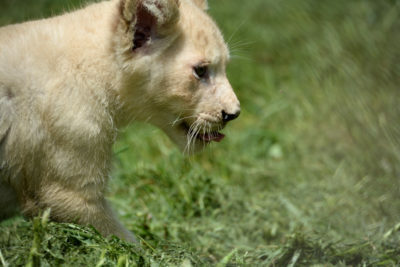 White lions are a rare color mutation of the African lion that occurs naturally in the Timbavati region in South Africa. They are not albino; they are leucistic, which is a lack of dark pigmentation. They get their coloring from a recessive gene known as a color inhibitor. While similar to albinism, this gene is far less severe. White lions still have pigmentation present in their eyes, paws, and lips. White lions can range in color from pale blonde to completely white. Until the cubs are introduced to their father, Basa, they currently rotate on exhibit. Xonga and her cubs are usually outside in the morning each day.